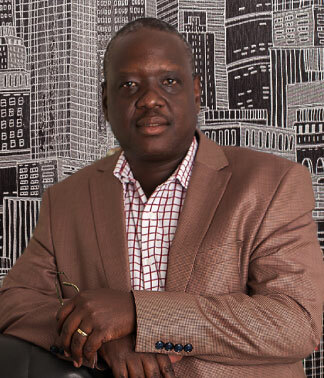 Isaac has over 20 years of architecture related professional experience in both the private and public sectors. He holds a Bachelor of Architecture Degree from the University of Nairobi; is a member of the Architectural Association of Kenya Architects and Project Management Chapters; and a registered architect with the Board of Registration of Architects and Quantity Surveyors. He is the Chief Executive Officer and oversees architectural and project management assignments at AIA. Isaac has an impressive design and management track record in myriad sectors including Service Stations, Office Blocks, Research Institutions, Showrooms, Hospitality, Medical Facilities, Private Residences, Large Scale Housing Schemes, Religious Centres, Recreational Facilities, Airport Passenger Terminals, Business Parks and Factories. Before joining AIA, Isaac worked at several firms. His formative years were at Dagliesh Martiall Johnson where he sharpened his technical drawing and project planning skills. He then moved to Triad Architects where he horned his project management skills. Thereafter, Isaac joined Symbion International and rose to make associate partner. Isaac is reliable and straightforward. He enjoys playing golf and has a passion for hospitality architecture and architecture for leisure.